Mothers who just gave birth need to renew their strength as soon as possible because they still have to take care of their newborn baby as well as muster enough energy to breastfeed their young. One post-natal supplement that was given to me was Serravallo’s Tonic. Serravallo’s Tonic — for moms who just gave birth. It’s a good post-natal food supplement. When I gave birth to our first born child, my husband’s cousin gave me a bottle of the Seravallo’s Tonic Bark & Iron Wine. It’s a kind of wine with an alcohol content of 14.5%, but it is highly recommended in Chinese medicine for those who have given birth and who have had surgery or some sort of medical trauma where you lost a lot blood. Seravallo’s Tonic is a product of Italy but a lot of the writings on its label and packaging are in Chinese. Additionally, we buy this in a local Chinese drug store called Hua Kong. So I believe that this is part of Traditional Chinese Medicine (TCM). It is said that it helps in recovery, helps those with anemia, and even improves appetite. Some mothers do not like this because of the alcohol content. This is especially a concern if they are breastfeeding. But in my case, I think that moderation is still key. And after all, I will not drink it continually, just during the first month after I gave birth. Also I drink only 1 cup at night before bedtime, just enough to give me a good night’s rest. The recommended dosage however, is 3-4 cups daily for adults. I think this would be beneficial to those who lost a lot of blood during childbirth. Of course, I will not stop you from breastfeeding because of its benefits for mom and baby. But you can still drink Serravallo’s Tonic. I would take this right after feeding at night and just before going to bed. By the way, Seravallo’s Tonic comes with its own shot glass, so you know that is the recommended serving size. My tummy is quite sensitive to iron that is why I easily get constipated with iron supplements. This is also the reason why I am also laying low with Seravallo’s Tonic. But well, my mother-in-law recommended it so I drank it. She would give me herbs or barks as tea or as ingredient in soups after I gave birth and I would dutifully drink them. I don’t doubt the efficacy of Chinese traditional medicines because I believe that the Chinese are healthier than most people. For my second daughter, it was my mother-in-law and our wedding godmother who gave me a bottle each of the tonic. So I am very thankful. 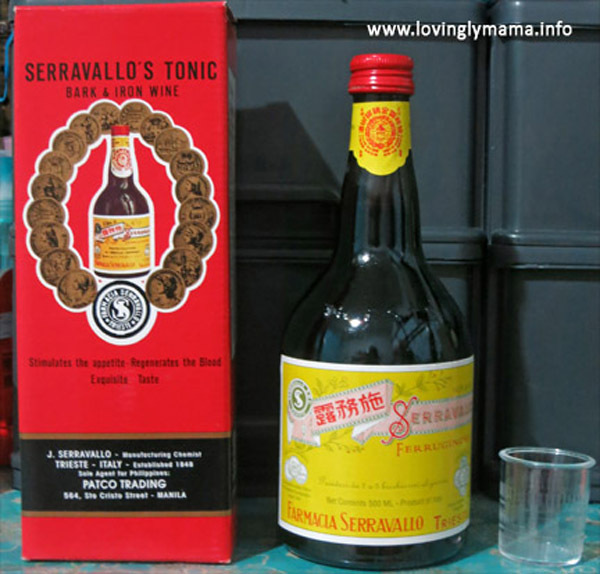 If you are not aware of this, do check out Seravallo’s Tonic in your local Chinese drug store. For sure it is available. Honestly, if it weren’t pricier than some table wines, I will keep on drinking this. I love the taste of Seravallo’s Tonic that I can keep on maintaining it, childbirth or not. Another good breastfeeding supplement would be malunggay capsules, because it encourages milk production in breastfeeding moms. Since it’s also rich in iron, it will help in replenishing blood loss during child birth as well. Just to be curious, do you think this would help during menstruation? If I have a heavy period, I tend to feel pretty drowsy and sleep like a bear in hibernation. If you think it might help, then I’m definitely going to check it out. I recently tried out a Chinese herbal remedy called “Nin Jiom Pei Pa Koa”, and love it. It’s been great soothing my sore throat, and my mom thinks it’s been helping her with allergy symptoms. Not sure if you’ve heard of it, but I thought I’d pass it along. It’s always great to find out about other herbal remedies, and I really enjoyed this post. Pei Pa Koa the liquid? We take that for cough. I think Seravallo will work for you especially if you bleed a lot during menstruation. Twill help replenish the body because of the blood loss and the pain. If you are not averse to alcohol, try this one, maybe 2 doses (after lunch and dinner) during menstruation and maybe 2-3 days after. 😀 Hope this helps. That definitely helps. Thank you ^_^ It’s nice to know how much would be good to take and when. I’ve checked out the local International market and our Asian market, but neither have this. I haven’t been able to find it online either… Weirdly enough, I keep coming up with postcards of advertisements for it :/ Maybe specialty wine shops might carry it? I’m kind of running out of ideas on how to find it, and I really want to try it. This is Seravallo tonic is interesting. I had never heard of this drink for post partum wome before. It’s great you found something that works for you after childbirth! Seems a medicated drink, never knew that Serravallo’s can be so beneficial for new moms to restore their iron counts and energy levels. Thanks for sharing, I never heard of this one as medicinal drink. Would recommend Serravallo’s Tonic to friends who are pregnant and about to give birth. I am glad there are preparations like this available for women who just gave birth. I was reading your post and was surprised to know that this Serravallo’s tonic will also help with other diseases, not just iron deficiency. I have never heard of Serravallo’s Tonic but it sounds like it has lots of great health benefits. It’s really important that we make sure that a new mother is taken care of as well. Their health is just as important as their new baby’s health. This SErravallo’s tonic sounds great! Thanks for sharing. This product sounds interesting for new mothers. This is the first time I have heard about Serravallo’s Tonic. Whilst this drink may have certain health benefits, I, not sure if Serravallo’s Tonic is something that I would like, especially as a breastfeeding mother. Maybe good if you are not planning on breastfeeding due to the alcohol content.